The fishing has been very good on three North Carolina lakes this winter. Jordan Lake, Gaston Lake and Shearon Harris Lake have all been steadily producing quality fish. After Christmas, we got on Gaston Lake and reproduced nearly the same results as in November. 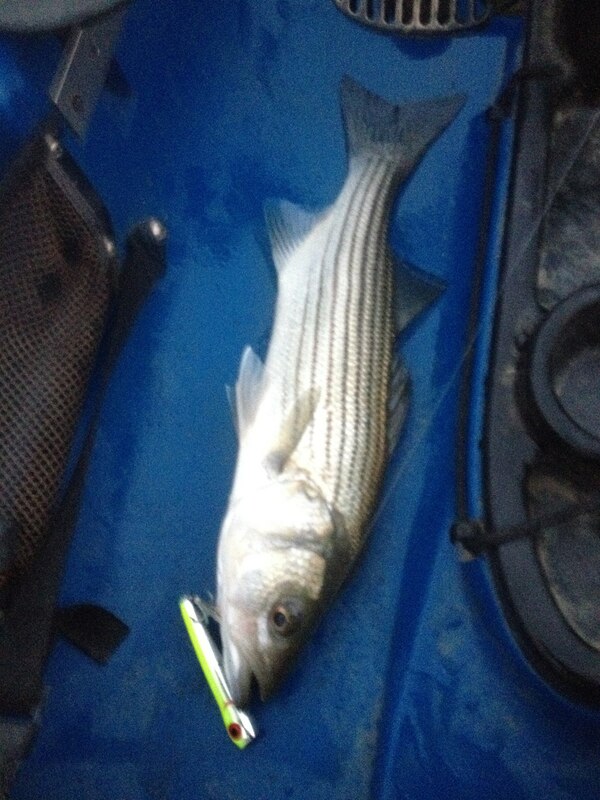 Striped bass were still chasing baits trolled slowly in twenty plus foot of water. We had success with sassy shads, swimbaits and Bama rigs. Four colors of leadcore and we were in the zone. We just had to stay under two miles per hour. 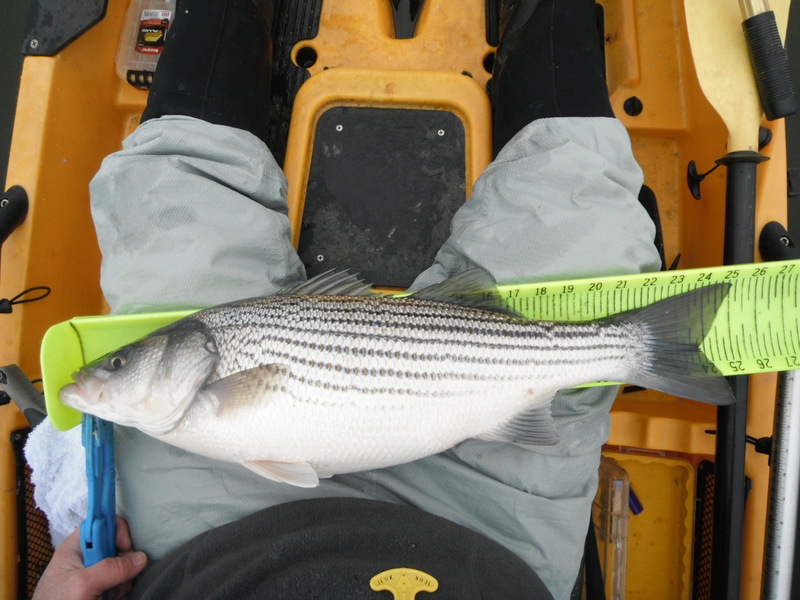 Then, in early January, we got on Jordan Lake and started catching striped bass in lots of different areas. Fish are hitting slowly trolled artificials, swimbaits and also are taking metal jigged vertically. The mix of fish has been good as well with nice largemouth bass, white bass, white perch, crappie, yellow perch, catfish and even carp. Small baits are again producing far more fish than anything bigger than the small shad on the lake in abundance right now. Harris lake is fishing very similar to Jordan lake. Main lake points and current breaks anywhere adjacent to baitfish and deep suspended target fish. Fish slowly and patiently; you could be waiting for 1 or 2 bites a day, but they could be giants. Bass are present and feeding early and late in the day in twenty feet of water. Kerr lake was fishing really good last fall and early winter. I got on the lake in late December, and we caught fish, but they were all shorts. I haven’t been back or heard much from locals there in weeks. Here are a few from this morning on Jordan lake. I was on the water three hours and caught my personal best largemouth and a very big striped bass minutes later. The winter bite is the same as it usually is this time of year each year. You just have to fish steady and believe the bite is coming. And when it does be ready. Use your electronics and don’t fish areas without bait and marks on your sonar. Make note of the depths you’re in when you catch and stay in those depths. I’ve had the topwater on the fly rod ‘bug’ lately, and got out on the river yesterday for several hours. But yesterday there were tons of takes, and the bass came to play as well; especially as the final hours of light cast their long shadows and the sun neared bed for the day. I started out catching bream by the dozens, literally cast after cast. They were all stripped in, none big enough for a long enough run to get on the reel, but a ton of fun nonetheless. Such a fun day on the river…I think I’ll go again now! Had Another Front Page on Ncangler this week! My buddy Scott and I hit Jordan Lake again on Sunday for the afternoon, and the fish were really active. The weather was crazy, with the tropical system quickly passing to our west, the winds were up and down, cloudy one minute, sunny and humid the next. But, the bite was on. I was trolling KVD 1.0’S all afternoon and caught a ton of fish. Lots of perch, (including a double) largemouth bass, crappie and even a catfish, however, most were smallish. But after we paddled across the lake, when the wind reached a point from the southeast that pushed the waves to white-capping (trying to escape) we found an area virtually unaffected by the weather and saw a couple bald eagles retreating to a tree approximately 200 yards from our position. Scott loves photographing birds and so we split up for a bit. He got photographs of eagles and egrets, while I tried to figure out how to fish that side of the lake. After an hour or so, the wind lightened and we were drifting back across the lake, and over a hump; that’s when the bigger bass, maybe 3 pounds plus, hit the slightly moving tiny crankbait. 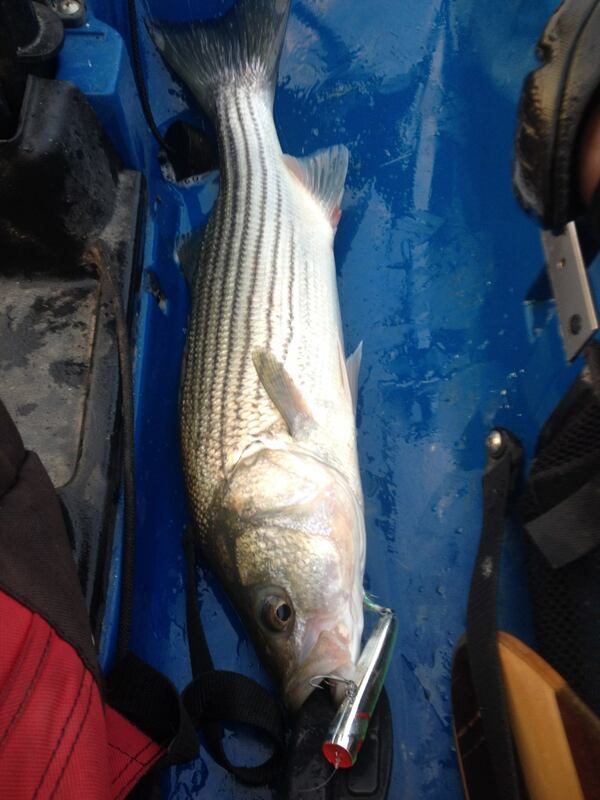 It doubled the rod over and started shaking its head so violently, I was sure it was a striped bass. The fight lasted probably 4 or 5 minutes too, this bass was a really hardy character, which allowed Mr. Kroggel to get some really cool pics…. ….which led to the front page on Ncangler.com Monday morning. I even had a violently-ill crappie stick a hook in my finger for this effort!! The audacity of that pound for pound superior fighting fish! Actually, I boat flipped it green and paid the price lol. It was a perfect Sunday. Best Striped Bass Topwater Bite of All Time! Striped bass and largemouth bass were slam knocking the chug bug out of the water this morning for almost 3 hours! It was literally the best topwater bite I’ve ever seen. And I’ve had years of throwing Poprs, Buzzbaits, Jitterbugs etc…you name it. There was sufficient cloud cover and the wind stayed down til I left. The fish were so keyed up they were knocking the bait out of the water almost a foot at times, and doing it repeatedly. I’ve never seen anything like it. Then they were coming back for it and engulfing it. I had stripers jumping like largemouth, It was incredible. Fish after fish til the clouds broke and the sun came out. 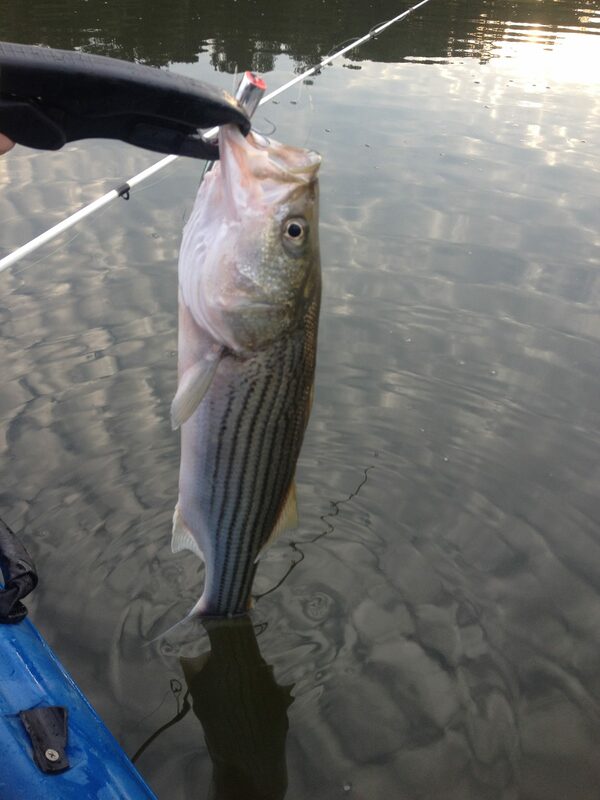 I probably caught 10 – 15 bass, biggest around 3 lbs, 8 striped bass (all skinny but 3 at 24″) and 2 white bass. Both whites swiped at the bait and hooked themselves on the outside of their body. It’s a big bait for a white for crying out loud. I left the lake a little after 9 and was home and cleaned the fish by 11…That’s what I call a meat run. So the family decided to get together and fish for Mother’s Day Weekend. We opted to chase largemouth bass but didn’t bargain for the alligators. Especially those in excess of 10 feet long. We wanted to hit the grass flats and chase drum and trout, but heavy rains the week prior to our outing and high winds changed those plans. Then we thought we might hit a slow moving black-water river, but the gauges rose all night long the night before, so we again made an audible. Greenfield Lake it was. It was small, close to us in Wilmington, and would be far more protected from high winds than anything else we could think of. This is a really beautiful place. The fishing pressure it gets is obvious, so I don’t really recommend it for a trip as far as angling, but as far as a place to see some really cool wildlife, both reptilian and avian, it’s a must see. There are bass, gar, bowfin, perch, bream, crappie, pickerel and catfish, but they obviously see everything off the Wal-Mart shelf daily. So we caught fish, and some nice ones too, but it was a serious grind. This was my best bass of the day; a 4 pounder that ate a weightless senko. 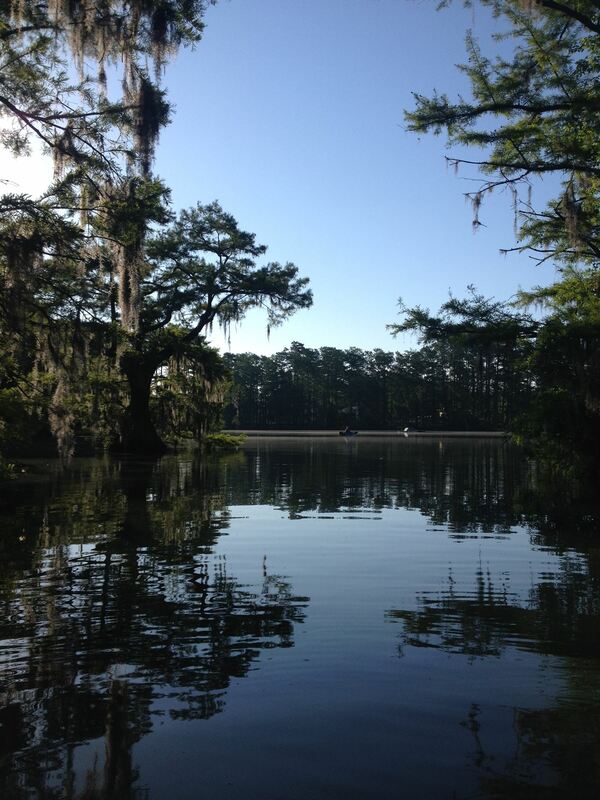 As the morning began we drifted slowly and quietly through Cypress trees covered in everything from Bayberry to Poison Ivy. 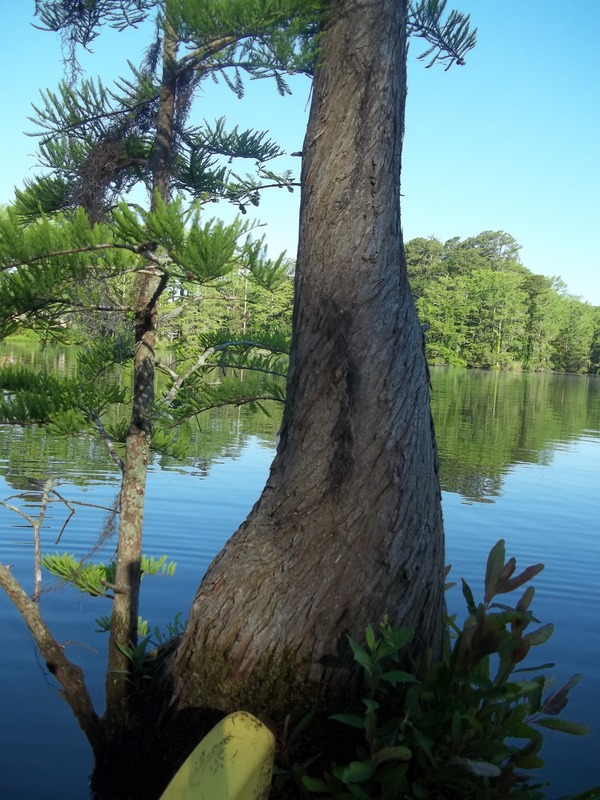 Wax Myrtles and Azaleas surround the lake too, but the Old Man’s Beard hanging from all the Cypress and Sweet Gums is what really catches the eye here. 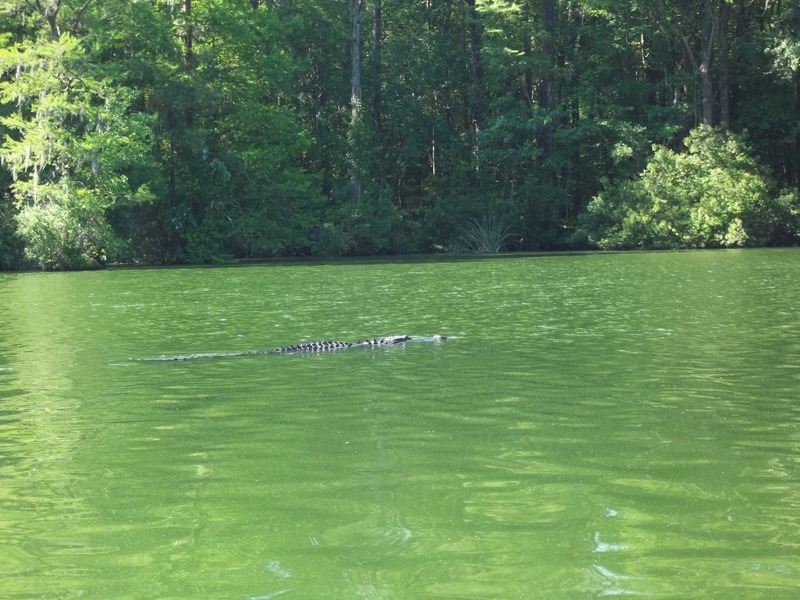 We had been told that there were rumors of a big alligator here; like a 14 footer. Let me rephrase that, we figured after what we’d been told; there might be an alligator in these waters, like maybe a small one with an exaggerated size to keep people from the small city lake. But we didn’t expect to see close to 10 alligators with 2 of them around 10 plus feet. But that’s what we got. Here is the video of an 8 plus foot alligator I saw after a few smaller ones. So yes, I probably did cross a line while filming these alligators. It could be said it wasn’t smart to get so close (even though the videos in no way show how close I really was). But I was ready to get away from them at a moments notice, and I kept them in my sight the entire time I was close. When they submerged I stopped filming and got out of the immediate area. I’ve also kept reptiles, both native to NC (when I was a permitted NC wildlife rehabilitator) and exotics in my lifetime (including large constrictors). I am also keenly aware that the intelligence these prehistoric creatures have far surpasses what science would grant them based on their brain size. I knew when I was filming when they were aware of me, when they were ok with me, and when they were tired of my presence. Body language does reveal a lot in the animal kingdom. I also knew these gators have been in this location a long time and they have never had an incident, even though there are houses all around the lake, and visitors in the waters on a daily basis (there are even kayaks and pedal boats available for visitors to rent in this small lake loaded with alligators). So I certainly don’t encourage anyone to get as close as I did to a big alligator; no more than I encourage anyone who doesn’t feel able and comfortable to kayak fish in swift water, or to go rock climbing without experience and knowledge. But I do encourage people to get out there and experience stuff like this at whatever level they happen to feel comfortable with. I know my life was enriched by experiencing this yesterday and I wouldn’t change a thing. 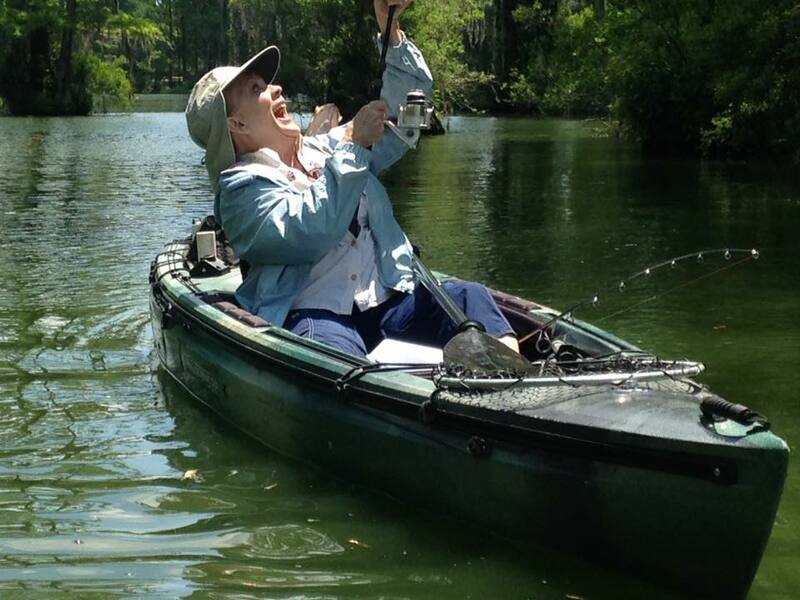 Here a few pics of Mom catching her bass. My next interview will feature Chad Hoover. Chad Hoover is a busy guy to say the least, and he is one of the most influential and charismatic guys in the sport of kayak fishing. His credentials are extremely impressive, and he may well be the most recognizable face and personality in the industry today. 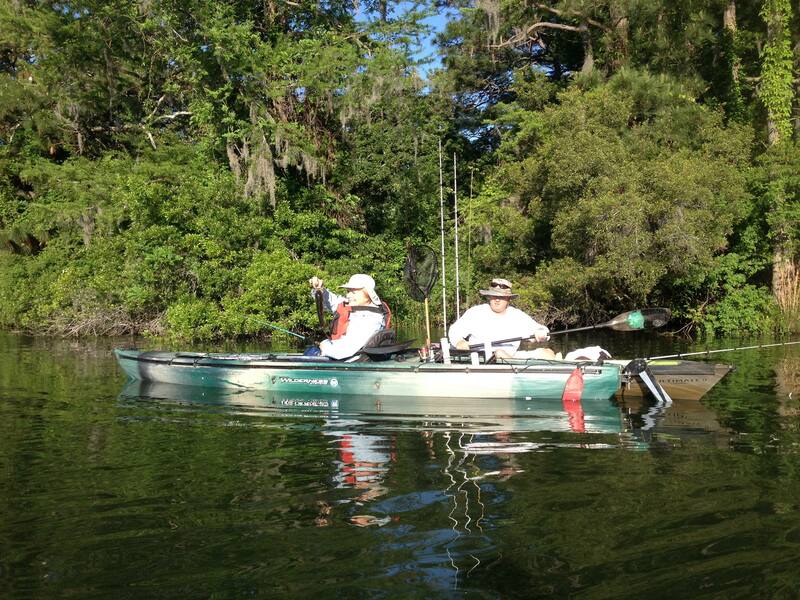 Chad is a partner at HOOK1, a cutting edge kayak fishing gear store. 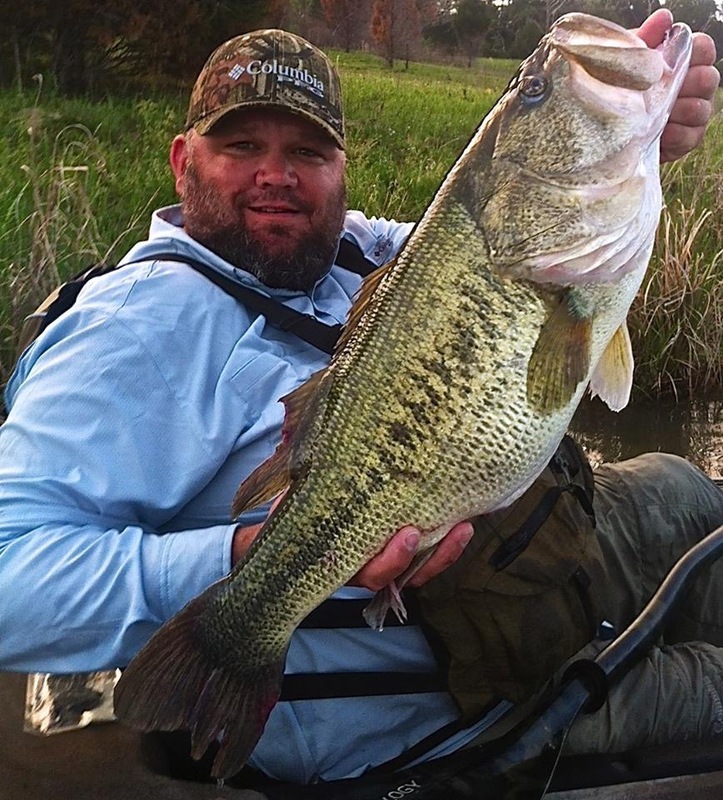 He has also filmed two fishing series, Knot Right Kayak Fishing which ran episodes on NBC, and a newer show KAYAK BASSIN’ TV, which airs on World Fishing Network. He hosts the KBF OPEN yearly, a huge, two-day kayak fishing tournament on Kentucky Lake, which sports hefty, record setting cash prizes in the field of kayak bass fishing, and has also somehow found time to develop CONSEAL – a deadly efficient sound dampening system for kayaks, which he is understandably very excited about. Chad is currently focusing on opening the HOOK1 location in Hendersonville on April 1st 2015, and managing all the complexities of his tournament series, which is a qualifying event for the 2016 KBF Open, which will again be sure to have record-setting cash payouts. 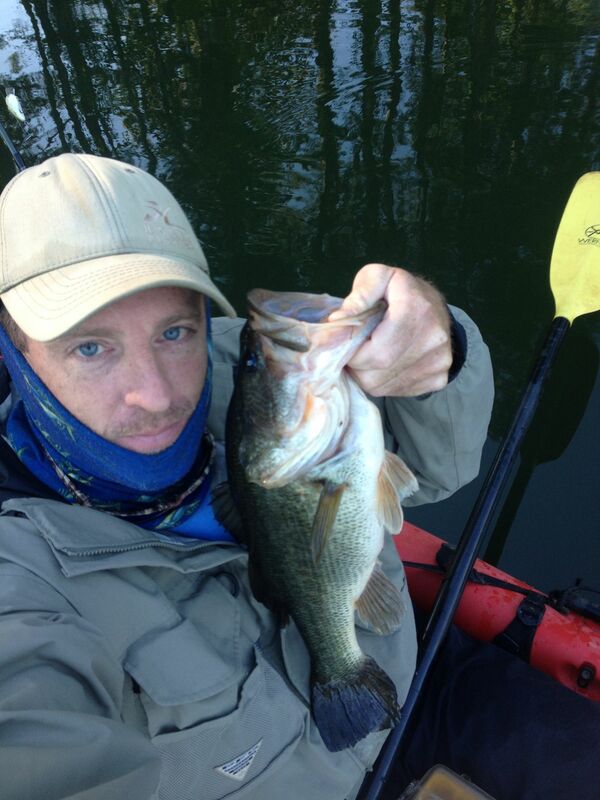 He is also engrossed in the release of CONSEAL and shooting this season’s episodes of KAYAK BASSIN TV’. This guy is off the hook. His energy and passion are both inspiring and contagious and he continues to branch out in a myriad of directions. Ultra-talented is an understatement. The interview is in process and will be released soon here on Adventure Nature Writing. Let the Kayak Wars Begin! Brother Joey got out yesterday before the snow and ice started to fall from the sky. He found stripers and catfish willing to bite on the Cape Fear river. 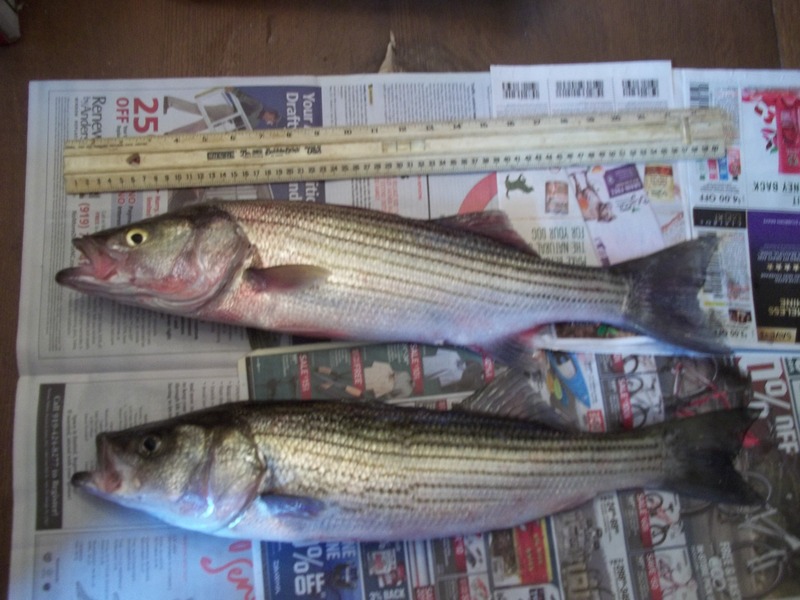 Best striper was 25″ and 8lbs. The rest of the team stayed warm and dry while he carried us to start the nearly year-long tournament put on by Kayakwars.com. Nacho Fish took the Northeast freshwater division again last year and we plan on three-peating this year! Anyone else get out yesterday before the ice? Let’s hear your stories or your smack talk! Let the Kayak Wars begin!